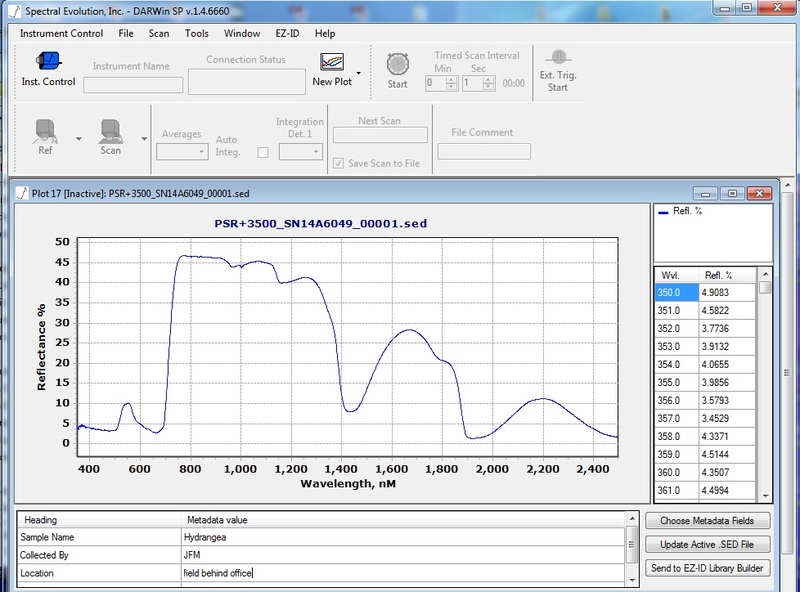 Quickly identify your target samples with EZ-ID software for SPECTRAL EVOLUTION spectrometers and spectroradiometers. Built into our DARWin SP user interface, EZ-ID provides real time mineral identification for field or lab use. 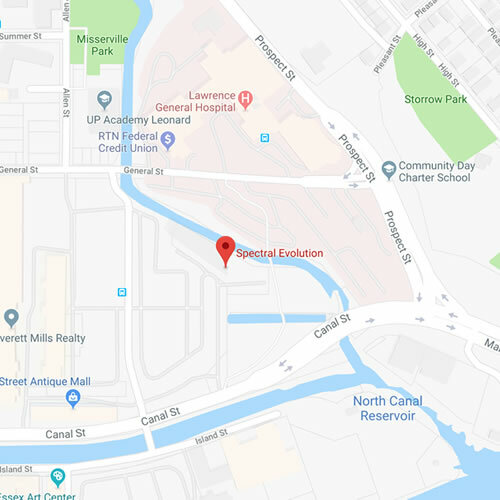 Scan your target data and immediately match it against a known library, such as the USGS library which is included with EZ-ID. Or choose the optional SpecMIN library or the new GeoSPEC High Resolution Library comprised of scans of samples from the Colorado School of Mines Museum collection, or create your own custom built library. EZ-ID provides a Library Builder software module so you can quickly and easily create and add to a custom library. By ordering all three you have access to 2600 spectra for 1047 minerals. 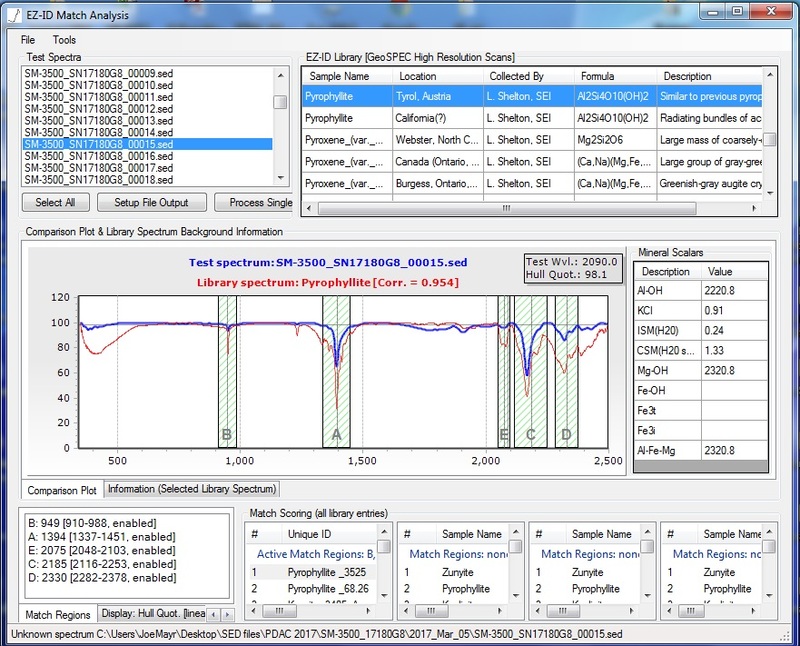 EZ-ID includes scalars to better understand geochemical conditions at alteration. 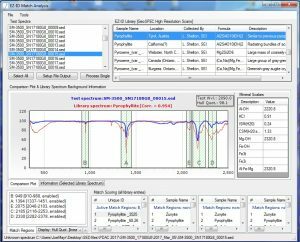 EZ-ID software works with samples from a wide range of applications including vegetation studies, soil research, crop health, raw materials identification and QC, plastics identification, minerals, and more. An example of EZ-ID software identifying a target scan of a plastic as an acrylic by matching it to a known sample in our spectral library. This example shows a match to a custom library. EZ-ID also works with commercially available libraries. EZ-ID provides multi-column score tables for comparison of different matching results based on different combinations of selected match regions based on absorption features. It also has batch processing capabilities that allows geologists to save their scan files in a format, a comma separated file, or a tab delimited text file. Batch processing is frequently used to format scans for use with other 3rd party software for geological modeling or mine planning. EZ-ID also includes comparison plot, information, and bibliography features for library entries. Create your own custom library of mineral spectra for a specific set of minerals, locations, projects – quickly and easily with our Library Builder Module. Library Builder is a powerful tool for creating a custom library that will make your identification processes even more accurate. You can build your own custom library by scanning known samples and entering your critical metadata. Metadata can be customized to include information specific to you application. For example in a raw materials inspection/QC application you might include vendor name, lot number, and similar information. In a vegetation library, you might include location (including GPS coordinates) time of day for the scan, atmospheric conditions, and so on. 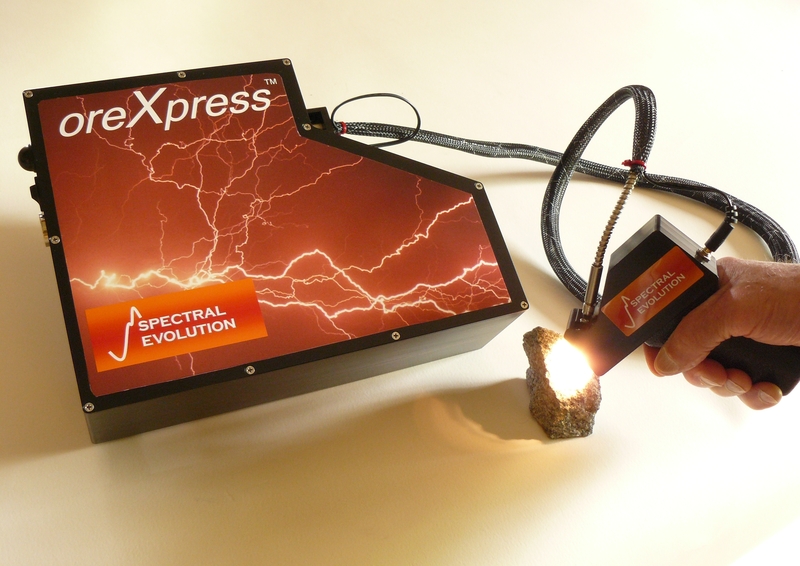 EZ-ID software is ideal for mineral identification with an oreXpress spectrometer for mining exploration. To learn more about EZ-ID for mineral identification, click here. 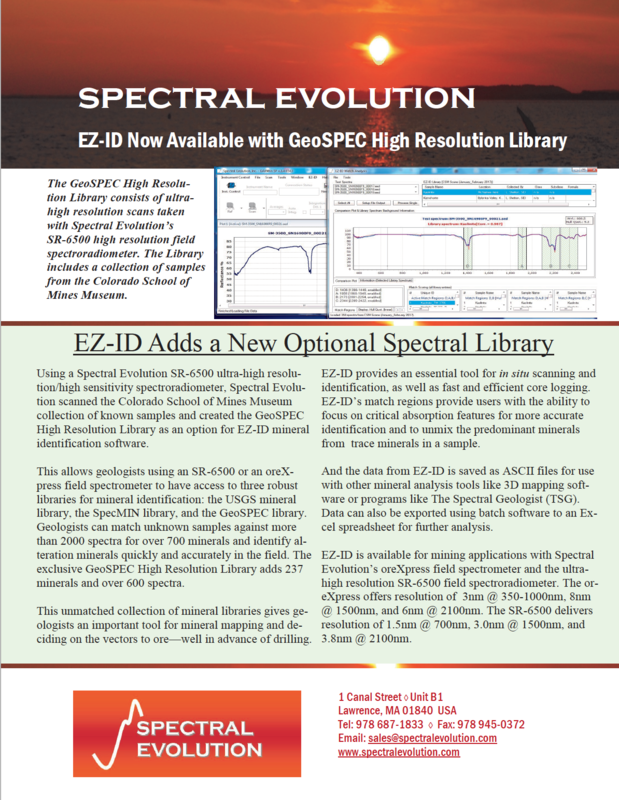 For more information on EZ-ID with GeoSPEC High Resolution Library, download our brochure.